Confession: It would help me out a lot this week if you would write in this space instead of me. Here’s how. Twice in a few months’ time, I’ve been given the opportunity to speak to small groups of women about relating with modern technology – especially social media. One of the assignments is behind me, and one is still to come. I intend to talk about the pros and cons, about temptations specific to women, and about how to make sense of living well in both the real world and the online world. My own mistakes and temptations are ample cause for humility. I have so much to learn. Today I have a few questions for you. Would you be willing to answer any (or all) of them here? I’d love to learn from your experience. Do you feel happy/ comfortable with your current use of online spaces? What are some of the gains or opportunities you prize most highly, in using modern technology? What is your greatest challenge or stumbling block? What do you struggle with? How do you coach your children in online use? What habits have you established for them? Have you experienced the world wide web as a significant place of blessing or being blessed? I promise not to use material personal to you unless I ask your permission. However, in writing here you are granting me the freedom to learn from you, and to respectfully share the things I’ve learned with others. Please don’t be shy of the new blog format – Leaving a comment is as easy as ever, except when it’s not, and then we scream RYAN! together. Besides, it is still me back here, my usual bumbling self, and if you need me to drop a bad word to convince you of it, I’ll do it. Take your time, I am listening. 1. No. My online habits need more time, thought, intentionality and wisdom gone into forming them before I can be comfortable with my usage. One of those areas that needs to be revisited for checkups. 2. I LOVE being able to video chat with mom and she can see my daughter and my daughter sees her. I am so thankful for the opportunity to long-distance connect with siblings, friends, etc. 4. No phone to the bedroom. Limit phone time when I’m in my daughter’s presence. I don’t want her to see me on it constantly, or for it to be something she has to compete with for my attention. 5. Since she is only 1.5 there is still the “no playing with mom and dad’s phones. She has her own old ones of course, and is aloud to hold ours for phone conversations/video chats, but only when we give it to her. Thanks. It’s good for me to stop and evaluate. 1. Facebook–meh. I cut back because everyone else’s emotional baggage depresses me. Sometimes a good YouTube sermon can perk me up when I’ve missed too much church. During a hard season of sick children recently, I binge-watched Downton Abbey late at night. I can’t imagine that it improved my spirituality, but it was delicious. So I’m working toward that happy balance, I guess. 2. I like being able to write what I think about on my blog (at least the parts fit for human consumption). It makes me feel like I have a voice, yet I’m not torturing anyone into listening to me. Writing makes up for a little of the social lack I experience otherwise because of my deafness. I also connect with people in my town through social media, since that is a primary way they communicate. I might not go for a beer with them, but I still end up hearing a lot about their personal lives and I try to give them love and a listening ear. 3. Wanting to argue with people. Wasting time arguing with people. 4. I generally find making rules for myself ineffective. 5. No online time is free for the kids. If they want it, they have to work for it. No violence, immorality, or bad language. 6. I have a ministry support Whatsapp group that has been a lifeline for me, since I don’t have any local close friends. A few blogs have helped me over some rough spots. My favorite though, is when I connect with a local need, then do something about it. I find out through Facebook that someone I know here in town needs propane to keep their family warm, or help with moving to another house, or a ride to the ER late at night. Meeting those needs when I can makes me so happy. I feel this subject is very important so I’ll do my best to answer these questions for you! How do you coach your children in online use? I would love to hear your thoughts on social media, online use, ect! The above post is by Shari Horst… just to clarify! ? Happy with my current use? Mine personally, mostly yes. I seldom use social media, I’m not on Facebook, and I don’t have a smartphone. I think it might be hard for me to be disciplined about that, so I choose to stay away. I read a few blogs of certain people and ministries I like to hear from. I avoid those that make me feel depressed/jealous/other negative emotions. I read, play games, watch videos, listen to music. I think my point of stumbling is not what I do online but when and how much. Opportunities I value? I’ll call it education. I really am glad to be able to quickly look up recipes, remedies, crafts, songs, information of many kinds. So much easier and faster for me than going to the library. I enjoy tutorials on YouTube, educational-type stuff for me and the children, how things are made, etc. I try to avoid click-baity and sensational presenters and bad language. I use an ad blocker, and our home network is filtered. Greatest challenge or stumbling block? Wasting time, i.e., using my computer when I should be doing housework. When I find this getting out of hand, sometimes I’ll not even turn my computer on for days. Then I get people saying, “Didn’t you see my email?” Sorry. You can text me. Children’s use? With permission for specific use (E.g, “May I watch xyz?”), and quit when told, no bad language, no violence. Game time is (usually) earned. Sometimes we play “Video Cleanup” where they watch a video then clean up for the same amount of time. Ideally, no screen time if there’s homework or chores to do, but I’m not as vigilant/ consistent as I ought to be. 1.Do you feel happy/ comfortable with your current use of online spaces? Not always. I have a hard time saying no. 2.What are some of the gains or opportunities you prize most highly, in using modern technology? Availability of information, like recipes, tutorials, lists, apps on my phone, online shopping, etc. 5.How do you coach your children in online use? What habits have you established for them? Our daughter is 15 and has had her phone for a couple months. We feel that we need to teach our children how to use modern technology wisely instead of just saying, you can’t have it. At the same time, she needs rules in situations where she can’t do her own controlling, for example, use of the camera, watching videos, time spent just chatting with friends. Her phone is filtered, and she’s not allowed to be messaging friends past 11pm, and it charges in the livingroom at night. 6.Have you experienced the world wide web as a significant place of blessing or being blessed? Mostly I’d say it’s a blessing. Ease of communicating with hubby and daughter, being able to shop from home(esp when I had a new baby). yet, it has it’s pitfalls too, that have already been mentioned in previous comments. I will try to answer your questions in essay form. I’m not very happy with myself when it comes to being online due to me spending too much time on my tablet. I get on in the morning and before I know it, two hours have gone by! I really need to make rules for myself in this area. I admit though because of social media, I’ve made many new friends. I’ve learned Biblical womanhood through being online because most churches are not teaching it. I have to confess that my biggest stumbling block is my need to defend people who are being verbally attacked on their blog or being taken advantage of. Sometimes I want to give the offender a firm tongue lashing and I suppose that’s the Mama Bear in me. My daughters are young ladies and adults now so I don’t monitor their online time but if I could do it all over, I would have been more careful in what we allow them to do online. We fell into the “other Christian parents let their children go the _______( Fill in the blank)trap. As I reflect on our exposure to the world wide web, mine especially, it’s been mostly a blessing because as I mentioned earlier, I’ve made new friends, many whom I’ve met in person. I’ve learned from other godly women, how to be a godly wife. 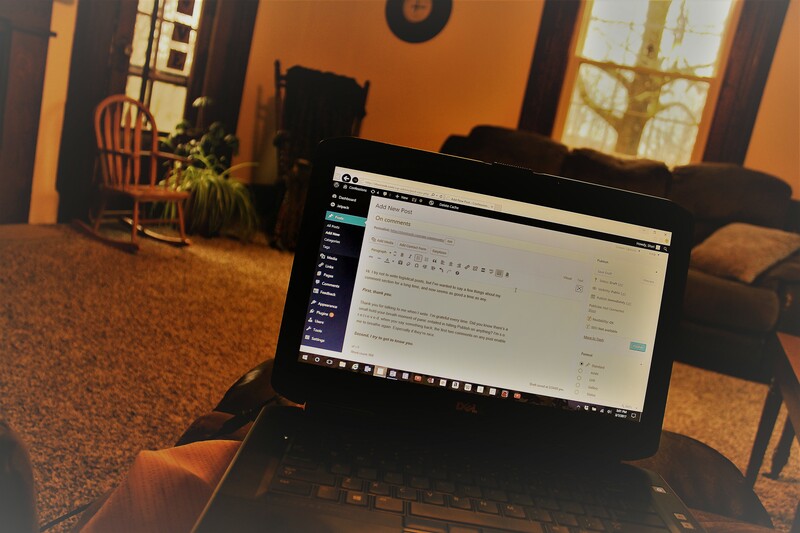 I hope to be a blessing and an encourager to other woman as I write my own blog posts. I’ll not answer each question separately, because Vivian above almost did it for me.I have a few small additions. I have a few favorite bloggers whose inspiration has been Heaven-sent at times when I sorely needed it. So that’s good. The down side is my own struggle, being, “the fear of man bringeth a snare.” This is one big reason why I need to keep constant tabs on myself. I am very happy with where I am at with a good balance of on-line time and real life time. I will never be a part of the social media life like Facebook or twitter or those type of things. I limit my on-line time to my favorite blogs. In addition to this, I do on-line searches for real life problems-like searching out the best price for a purchase or what is the best stain removal or those types of things. Because I do not have an on-line presence certain family members and friends refuse to communicate with me -they do not like to communicate the old-fashioned face to face or telephone way so I just communicate with them when I happen to see them face to face only. At first I felt I was missing out on a lot of life but now I feel I have a much better quality of life and I don’t worry about what I might be missing out on. I use my instincts to form an opinion about someone whereas a lot of people judge by on-line comments people make. I feel talking face to face is a far better way to form an opinion of someone. I feel I spend far more time living real life than many of my friends who are so busy documenting what they are doing they are missing the most important part of life. My belief is that these things are tools designed to help us live more productive lives not to hold us captive. I must say, I’m read many of the replies and I find myself relieved that some ladies have the same struggles regarding social media as I do. I love hearing about other people’s experience. Thanks for being honest, everybody; I’m enjoying this conversation very much. Hey… interesting stuff here! 🙂 i was just saying to a friend that we have so many more struggles than Ma and Pa did because of social media bringing on things like: comparison, envy, wastefulness. Hopfully you don’t mind… I’ll just throw out a few general thoughts. I started Facebook mostly to put lots of pictures online for family that is far away, and now that Mama is 40 minutes away, she can still see some of the stuff I’ve been doing and vice versa. I’ve found it to be a helpful way to begin relationships with people (and I emphasis BEGIN). Oftentimes when new people visit our church and find it intriguing, the first thing they do is friend me on Facebook. I can see their interests and their passions (if they’re honest online) and engage them in conversation next time they visit. The scary, downside of this… is that I have to be honest and open on Facebook, if this is where friendships BEGIN. And like Kim said, there are friends that only communicate via social media, and those friendships kind of slip away… telephones and face-to-face are the only thing that really keeps me heart-to-heart. As for my children, they pretty much say “Mom can I watch …. ?” and I say, yes, or no… do your school work first, etc. They use Google freely for info, but the computer is in plain sight, so I can monitor content as well as length of time. In general though, I’ve found reading full-length books much more inspirational and instructional than short paragraphs on Facebook or a blog I flip over to from Facebook… mostly because my mind and heart aren’t very engaged when I’m skimming/browsing on Facebook. Haha! These are great thoughts, sis… Thank you. Just a few thoughts. I try to stay off the computer for the last while before bedtime (I’m not doing so well tonight though). That’s partly because I’ve read that step is important to get your body ready to go to sleep for the night. Even a phone is very bright and can trick your mind into thinking it’s day-time. Some of my age-mates have face-book,partly to help them keep track of their children. I don’t have children so I don’t have that excuse (ore reason). I think I would love face-book but I think I spend enough time in front of the screen as it is. I believe it’s much easier to not get started with facebook, than to get started then try to stop. Sometimes I don’t find things out that “everybody else” knows. But I think I find out what I need to know. I do read some letters in the Budget. Some people compare that to facebook and there are similarities. I use google sometimes, but I prefer paper, especially when it comes to Bible commentaries, etc. My oldest 3 children are 17, 18 n 20… they are all connected with Covenant Eyes, have ad blocker, as well as one that has you tube and safari blocked, so When he needs to get online he uses a main computer in living room. Dad also has random frequent accountability chats as to how they’re doing, anything tripping you up or keeping you from victorious living?? Our youngest 11 yr Old is allowed her daily dose of online odyssey club stories or you tube video for a limited time and only after all homework is done or earned by chores.. The modern techy ways of WhatsApp, Voxer, or group me apps are wonderful ways to easily connect and send pictures with my out of state family, and my Haitian friends even in a fairly remote village, as well easing the strains of long distance dating via FaceTime for my engaged son. I love the ease of amazon shopping for basic needs like cosmetics n computer ink, paper etc… a trip to Walmart is rare after getting a few basics from dollar general 2 mi from my house. Studying to teach also is much better since I have access to many commentaries and my favorite Bible teachers thots etc…like John piper, Ravi Zacharias, n John Maxwell etc. Also as a woman on several planning committees for women’s conferences, kids club, Drama teams, but not naturally creative or original:( I depend on YouTube or online web sites for ideas, themes, and crafts, but again get frustrated on how time consuming it can be!! I have been blessed following some inspiring blogs, writer friends etc but am sad that I rarely read books anymore because the little reading time I have is usually used in cleaning up emails or quickly reading a blog. And I really like my Spotify app which gives me unlimited supply of songs and praise music to play at anytime…lifting my spirits as I clean, which is what I use at times as a regulation to myself, no online scrapbooking till cleaning this first or laundry is done..
One of my goals for 2018 is to be more present with my children. (Saying “okay” from behind my phone is not being present, even if I’m in their presence). To help me accomplish this, I’m trying something: Do internet time only when the children are sleeping or having quiet time in the afternoon. Limiting my time on the web to precious personal time helps me to decide what’s important to read, and I feel good about that. Our boys (ages 7 & 9) don’t have internet access. However, my husband downloaded some cool games (Checkers, Sudoku, Spell Mania) and other cool apps (Knots 3D, Star Rover, Beaker) to an old phone of ours. The boys are allowed 20 minutes each per day on the phone. My husband suggested no internet after supper without permission. So, if we want to, we ask the other if we may. The other is free to say, “No.” Or “Why?” Or, “I think the kids would like time with you.” Most of the time we say yes. But it’s changed our default from an individual slipping into it because it is there, to a conscious choice shared by both of us. Personally I’ve stopped browsing Facebook. I just got depressed doing that and wasted time. So now I go on groups and if I want to see what a specific person is doing I’ll go check out their page. But I don’t scroll through my feed. As far as blessings. . .I’m not sure. I like email. I like blogs. I learn a lot from them. I think they are different from Facebook because they are one person and you are sort of getting to know them. It is fun and interesting and educational. But you know who I really like? I really like people who don’t do social media. They are unique and interesting and fresh. Sorry, I didn’t finish all the questions. I like social media for the point of contact that it gives me with a variety of people that I otherwise would not have. I have far more context to begin a conversation with a number of my far away aunts/uncles/cousins than what I had 10 years ago. I firmly believe that any online interactions (social media/blogs) cannot and should not replace real life relationships. I won’t try to answer the questions because I quit social media the beginning of the year, but I will say I love the freedom I’m experiencing! I hope I can eventually return to it in a very disciplined fashion, but for now abstinence is what works best for me. There are so many things I love about connecting online, the vast stores of information available, the life giving encouragement I’ve found through the words and lives of others. But I also hated the brain damage I knew was happening from skimming instead of truly reading, from the overload of information that I couldn’t possibly process, and the constant battle against getting caught up in online drama and problems I wasn’t meant to solve. I’ve been listening to podcasts by Dr Caroline Leaf, a brilliant Christian neuroscientist. She just started a series on social media and its effects on our brains, so if anyone is interested in exploring that angle of this topic, I highly recommend her teaching. The fact that the average person spends eight hours a day on social media should at least make us pause and ask, “Am I going to be content to be average?” ? I would like to check out this Dr. Leaf’s teaching on this. Sounds interesting! I like these questions, even if they make me slightly uncomfortable. 😉 Maybe that’s conviction. I will have to say that I have done the whole swing from one side to the other and probably back to what I consider the middle. I enjoyed facebook back when I first got on because we could connect with our families so far away – 2,000 miles. Just ask Jeanie Weaver. 🙂 I kind of got sucked into the whole social media thing and felt the pressure. Then God brought me around to really think about how I am using my time and is it pleasing to Him – such as is it helping me spiritually, merely neutral, or is it actually harming my relationship with Him and my precious family? I would have to say there was more harm than I realized. This past summer I took a couple months off Facebook to focus on my kids and I LOVED it. I really did. I noticed things in real life more….how sad is that? What was I missing before? So while I use social media some, it isn’t like it used to be. I like it that way. Yes, I have experienced the www to be a place of learning so much – that is the blessing. There are some awesome sermons and teaching sites that I visit quite often. But I also have been blessed by reaching out to others, sharing my own bumbling experiences, and finding friends that believe like I do. That has been a blessing. The huge downfall for me is the time sucker that it is. Have you ever heard of time blocks? I wanted to try that this winter and the times I did, I really liked it. This is where you set aside an hour or two for computer time only. Then you don’t check email or anything on your computer until you reach the set time, then when you are done, you close it up and leave it until the next time block. This is honestly the best thing I could do for myself! As for our kids, we give them each a set amount of “screen time” each week. Only the older ones are allowed to use filtered internet for certain things during that time. They aren’t allowed any social media – and I honestly do not know when we will allow them to, possibly 18-19 years old. It’s not a necessity in life, as I am finding out daily! Anyway, thanks for getting me thinking. God bless you in your research and speaking!